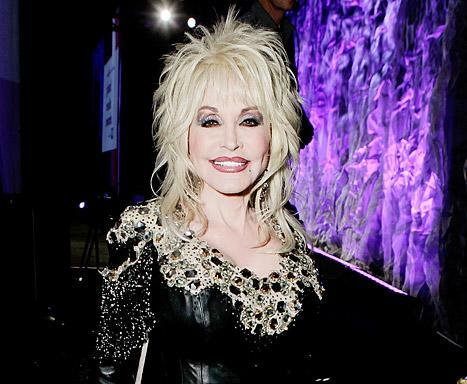 She may be 68 years old, but Dolly Parton is as hip as ever. The country legend recently took the time to chat with Us Weekly's Entertainment Director Ian Drew about everything from her feelings on her "extreme" goddaughter Miley Cyrus, to her love for Twitter, and her latest album Blue Smoke, which is due out tomorrow, May 13. The Grammy winner, who is set to kickoff a world tour later this year, also touched on how she and her husband of 48 years Carl Thomas Dean have kept the love alive for nearly five decades, and what she thinks of the new crop of country stars including Taylor Swift and Carrie Underwood. Catch up with Parton in the interview below! Us Weekly: I’m so excited about this album. It’s been four years since your last one, so I wanted to start with: You never slow down. Four years off is a long time for you—of course you were doing other things. Dolly Parton: Yeah, but it doesn’t seem like it’s been that long since we were doing the Better Day album and the Better Day tour but now here we are, like you say four years later doing it again. We decided we’d go back on tour and anytime you decide to tour you need a good record to go along with it and so we put together this one and I really tried to fill it up with things that kind of spoke to all of the music that I’ve done through the years, some of the blue grass stuff, some of the mountain songs, some of the gospel stuff and all the different flavors, so I think it’s pretty colorful—kind of sums me up pretty good. Us: Yeah and you have a few covers, of course, I wanted to ask you about those. First of all Bob Dylan’s “Don’t Think Twice,” and Jon Bon Jovi—so are you a rock fan? DP: Well actually, I hear a lot of rock music. My husband is a big rock fan. He loves rock and roll so I’m always hearing him play his music in his den and all through the years I’ve heard him playing different songs and I would hear and think, ‘Wow, that would make a really good blue grass/country driving kind of song for some of the stuff I do.’ So actually, I’ve stolen some of those ideas from him just playing his music and as you know, as you said, I’ve covered other things through the years but first time I heard Bon Jovi’s song, “Lay Your Hands On Me,”—being brought up in the Pentecostal Church where we believed in praying for the sick and laying hands and all that—I thought, ‘Wow, that would just make such a great song, a gospel-flavored song.’ So then when I called Jon and asked if it would be ok if I worked on it a little bit and if they’d be willing to help me out, he and Richie Sambora, and they were excited about it, so they threw in their two cents worth, I threw in mine and it turned out really good. Us: Wow, what was it like working with them, were they friendly? DP: Well actually, we didn't actually work together. They just, you know, suggested a few things and you know sent little messages here and there and sent lines in. I’ve always loved Bon Jovi and I loved the group and so that was just a favorite song, so they were real proud of it. Us: Aw that’s great. Does your husband like your music? Is he a fan? Or does he… you know, because you said he’s a rock fan but is he also a fan of your stuff? DP: Not particularly. He loves me, but he is not necessarily a fan of mine. So in fact when I did “Stairway to Heaven,” which is one of his favorite songs in the whole world, he was not real happy about what I did with that. He thought nobody should ever have touched that song but them, but I thought, 'well somebody should.' But he didn’t particularly care for my version of it because he is just so in love with the original—which, a lot of people felt that way—but you know I’m not afraid to try things and I love the song. I thought it made a real nice record and I took liberties with it like I do with so many things. Us: Is there anything else current that you’re listening to that you really love, or would like to cover? DP: To be honest with you, not really because I don’t really have time to listen to the radio. I don’t really go out and buy records. I just hear things. If I see something on TV I don’t try to keep up with any trends. I don’t try to follow anybody’s deal. Kent Wells, who produced this CD, we wrote the song “Home” together. He has the real good ear for what’s going now so he really did a really good job with the melody of that. We both worked on the words and the music but he was really, really instrumental in the musical end of that as far as the melody and all, so I think he knows what’s playing on the radio. I think that’s going to be our single I think off of the record, this song called “Home,” that we wrote together. It kind of has more of what’s playing on today’s radio. But I just write what I feel, I sing what I feel. I’m singing usually songs that I’ve written or songs like “Lay Your Hands On Me,” and just a few things outside that I like to put in the record. DP: Well she does it great. We did it together as a duet when we did the 25th anniversary of Dollywood. She and Billy Ray were nice enough to come be on that show with me and we did “Jolene,” and we sang it together and it sounded really good. So I’ve heard she’s being doing it in her concerts and she does do a great job of it. I think I saw something, somewhere on TV where I saw her singing it and it was good. Us: Are you a fan of her and what she’s become? She’s such a huge, out-there pop sensation now. DP: Well she is! I’ve always loved her since she was a little baby. I got to know Billy Ray when he was “Romeo” and was just the hottest thing going—“Achy Breaky Heart,”—and I did a song called “Romeo” and I had him in my video. So I’ve known her since she was a baby and I’m her fairy Godmother and I was on the Hannah Montana show quite a bit with her and I kind of got a whole new little audience because of her. But she was spectacular on that, but she just needed and wanted so bad to break out of that and wanted to become Miley Cyrus and she tried every way in the world to do it and nobody would let her go. So, she just had to resort to extreme measures but she pulled it off. She’s a very smart and talented girl and I really hope she does as great as I think she can and will because she’s a lot more gifted that a lot of people realize right now. So I hope her choices are good, I hope she takes what she’s done now and really turns it into everything that she wants it to be. Us: Are you shocked by her transformation into this sexpot? DP: Well yeah, but in a good way. I had to laugh, I thought ‘Wow,’ but I realized she had to do it, she had to go to that extreme, so bless her heart. I just hope that she has a long career and I hope that she gets a chance to do everything she wants to do. Us: Obviously so many people have talked about what an inspiration you are. You’re not only the Fairy Godmother to her but to like all these people in country, Carrie Underwood, Taylor Swift and all of them, who are you really just obsessed with, which of these young stars that you’ve inspired? DP: Well I’m not obsessed with any of them. I admire and respect them all. I really think Taylor Swift has done a wonderful job and Carrie is spectacular of course—she’s a sweet beautiful girl and can sing like nobody’s business—and I just really admire all of them. I just don’t really have a chance to listen to other people’s music all that much. I see them on their videos. I see them on the award shows. I see them here and there but I don’t really go out and buy records or really follow anyone that close but I really just think they're all doing good and I’m very proud of them. Us: How have you and your husband—45 years—been able to make it work? DP: Well we’ve been together 50 years in May. We met 50 years ago, we’ve been married 48 years on May the 30th but we’re good friends. He likes to stay home, I like to stay gone so that works out real well for both of us. Us: Finally one quick one, Twitter. You’re obsessed with Twitter that’s one thing that you’re doing. What do you love about Twitter and what’s been some of the craziest tweets you’ve gotten? DP: Oh Lord, people say everything and do everything. I’m trying my best to keep up with all this new technology and I surround myself with all these wonderful people that are in the know and kind of help me out with all that. It’s just a wonderful way to get stuff out to people. They feel like they’re connected right to you and they have a chance to kind of say whatever they want to say. So you just take it and do what you do with it. It’s a new day and age.